Our InternationalStudent.com team is heading out to present and exhibit at 10 of the NAFSA regional conferences. Our presentation will explore the topic of email communications and how to use email to leverage your conversation with potential students. In this session we will discuss ways to develop and implement a comprehensive email communication plan for lead nurturing. We will dive into identifying and setting goals, establishing an email series, and best practices to turn a lead into an applicant and beyond. You will hear from InternationalStudent.com, a company that sends over 8M emails each year as well as other international educators who are in the trenches using email to recruit international students. Stop by our booth or join our session so we can connect this conference season! The InternationalStudent.com Travel Video Contest is still open- but only until 11:59pm EST tonight! If your international or study abroad students have been working diligently on creating a video to enter into our contest, please remind them of the deadline. Each video should be four minutes or less in length and must include where the student wants to study. Students who are already studying outside their home country should include information on a trip they would like to take. Finalists will be named the week of November 7th, and the winners will be announced on the last day of International Education Week: November 16th. 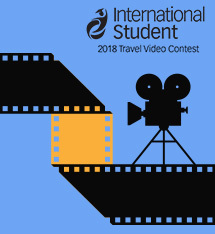 Stay up to date on the InternationalStudent.com Travel Video Contest to see if one of your students is our 2018 winner!